Sadly, while I was there, the timing was not right for taking pictures in this magnificent chapel, but I was able to get a couple of skewed photos to at least get a feel for the space. One of my favorite features that also shows up in a Phoenix chapel by the same architects is all the colorfully-painted detailing on the dark wooden beams. The rostrum was fantastic, and uniquely included large red plush chairs centered behind the pulpit. At the rear of the chapel was a balcony which I also couldn’t get access to. I will definitely need to plan another trip to Southern California. This entry was posted on November 3, 2011 by lds architecture. 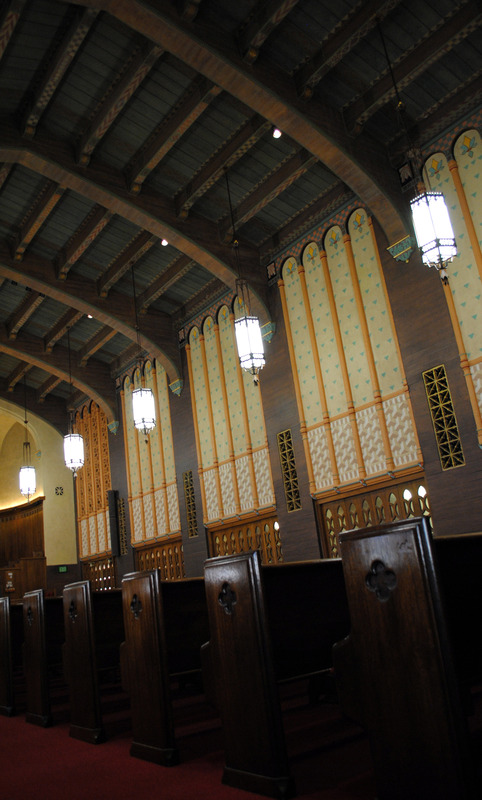 It was filed under Chapel Interiors, Hollywood Stake, Pope and Burton, Tabernacles . Stunning. Why oh why can’t our current experience be like this?